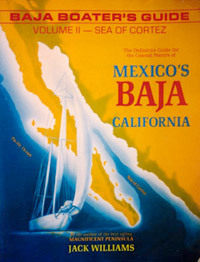 Baja, Mexico is not the first place we northerners think of when planning a sailing holiday. And yet, many sailors who have circled the world will often describe this as their favorite. As a long-time sailor, I wanted to capture that feeling in Baja, and compare it with, say the Caribbean which often tops the list when considering a remote sailing destination. Sandy and I left Edmonton, Alberta on a cold morning in February, 2001. Six hours later, we arrived in warm and sunny Mexico where we met our friends, Barry and Joan, from Vernon, British Columbia. We had booked a one-week bareboat sailing charter out of La Paz through the Moorings, which at the time offered the only charter sailing in Baja. After clearing customs, we took a cab to our B&B, La Casa Mexicana, for our first night in Mexico. From our room, we could see numerous yachts anchored in La Paz harbor. After dinner, we “wandered with abandon” among the shops along the waterfront. Everyone we met, the taxi driver, waiter, store clerks, and people on the street were friendly and helpful. La Paz, the “city of peace,” has a laid-back ambiance not often found in cities with a quarter-million population. We were starting to get that feeling. The next morning after breakfast, we grabbed a taxi to the marina where our 38′ Beneteau “Epiphany” was ready and waiting. After stowing our pre-ordered provisions, we checked out with immigration officials and purchased a few items at the local store. We then met with Don from the Moorings for our boat and chart orientation, which included a slide presentation of things to see and do within our recommended sailing area. Everything went like clockwork at this first-class charter operation. At noon, we left the dock and followed a well-marked channel out into the Bay of La Paz. We were basically self-contained, with all the food, water, and supplies we would need for the week, as there were no places to spend money within our sailing area. During the next seven days, we traveled only 50 miles north but what a memorable trip it was. In my many years of chartering around the world, I’ve never experienced the sights we were about to see. On our first day, we encountered dozens of bat rays leaping out of the water and doing double flips in the air: black-white, black-white, splash! There are various theories as to why they perform these aerial maneuvers; we just assumed they were doing it to entertain us! After 20 miles of motoring on a flat sea, we anchored in Caleta Partida, a large well-protected bay with high cliffs on both sides. The next morning we dinghied along the east shore of Espiritu Santo Island to view some awesome rock formations, including one cliff face, which according to Don resembled Alfred Hitchcock. A bit of a stretch … according to Joan it looked more like Jay Leno! In either case, right below his chin was a cave with a beachhead where we snorkeled for the first time. The water in early February was a bit chilly and the coral was not like you find in the Caribbean, but the fish were varied and colorful. After returning to our boat, we motored just a few miles further north to Los Islotes, two small islets that serve as a national wildlife sanctuary for a few hundred sea lions. The next couple of hours was one of the highlights of our trip. Because of an anchoring restriction, we took turns snorkeling off the swim platform while the other couple kept the boat in the lee of the islets. Moms and their young pups pirouetted through the water just a few feet away, looking very cuddly like the family dog with their big brown eyes. I’m sure our eyes looked as big to them! Occasional barks from the moms were suitable warnings that we were entering their domain and to be on our best behavior. What an incredible experience to swim alongside these graceful and gentle creatures. They were as friendly and welcoming as the local people we had met earlier … another dose of that Baja feeling. Hopefully, these encounters will continue with respect and admiration, as they are a rare privilege in the world of nature. An hour’s sail back south took us to El Cardonal Bay, one of several protected anchorages along the west side of La Partida Island. A short walk east along a desert path brought us to the Sea of Cortez. Here were more steep rock cliffs with various birds, including gulls, pelicans, turkey vultures, cormorants, frigates, egrets, and a nesting osprey. That evening, we turned out the lights and gazed at the stars which seemed more abundant and brighter than ever. You got the feeling you could reach up and grab one. Later, the wind picked up, really picked up! While the prevailing winter winds are northerly averaging 10 to 15 knots, on this evening the wind reached 30 knots and shifted to the west, blowing directly into our anchorage. The 15-mile fetch between the peninsula and our anchorage resulted in 2-foot waves, interfering with sleep for the captain and crew! By morning, the wind subsided to a more reasonable 20 knots allowing for some brisk upwind sailing as we headed north to our next destination — San Francisco Island. 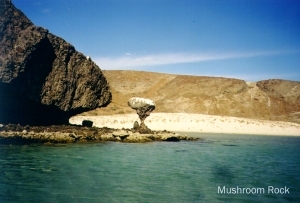 This small island is reportedly one of the most visited in the Sea of Cortez, which prompted us to spend a full day here. We began searching for shells on the white crescent-shaped beach. Then we hiked two-hours on a well-used trail edging a 300-foot cliff. The view from the top was impressive: we could see Espiritu Santo Island to the south and the wide expanse of the Sea of Cortez. Several hundred miles southeast is mainland Mexico and the more familiar tourist destinations of Mazatlan and Puerto Vallarta. Later, Barry and I did some dinghy fishing along the reefs and caught a few that neither of us could identify, based on years of fishing in northern Alberta! We then visited a small fishing camp in an adjoining bay where we were invited to come ashore and visit with the dozen or so Mexican men that make their living from the sea. These friendly fishermen proudly showed us their temporary living quarters. They eat, sleep, and pray in sandstone caves like primitive man. We felt honored being among these warm-hearted people who took the time to show us their way of life. Still later that day, we scrambled among the boulders at the foot of the cliffs we had climbed earlier. The geological structure is clearly volcanic with black lava flows layered between red and green rock embedded with shells. The various strata of rock and lava indicate some serious eruptions occurred in this part of the world eons ago. 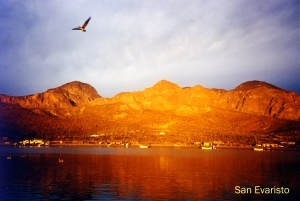 The craggy mountain range Sierra Giganta, extending up the Baja peninsula, is further evidence of major geological activity. The next day we tacked our way up to San Jose Island and anchored for lunch in the calm of Amortajada Bay. This is truly the place where the desert meets the sea. A forest of giant cardon cactus extends right down to the beach. A dinghy ride into a nearby tidal channel brought us to a maze of mangrove trees. Various species of fish could be seen swimming among their slender stilt-like trunks. After lunch, we sailed 10 miles northwest to the peninsula and entered a small picturesque harbor with the village of San Evaristo extending behind its sandy beach. Ashore, we mingled with the villagers — 65 in all, mostly fishermen and their families. Once again, we were in awe of the hospitality shown us by these friendly people. They appreciated our efforts to speak their language by referencing a Spanish phrasebook. On several occasions, we communicated best through gestures and laughter. For the 20 children in the village, we offered one of the men a gift of paddles and balls we had brought along. “Geronimom” graciously accepted this meagre gift “gracias, gracias, gracias” and later bid us farewell with an enthusiastic “adios amigos!” That “Baja feeling” was getting stronger. Early the next morning, we were roused from sleep by what sounded like dozens of rocks being hurled into the water. We imagined the sky was falling! It turned out to be a flock of pelicans diving for their breakfast of sardines. Often several birds would hit the water at the same instance similar to shells exploding in a war zone, gently rocking our boat. With just three days left in our charter, we headed back south with the help of a 15-knot northerly. One 4-hour broad reach brought us back to La Partida Island and Ensenada Grande, a spectacular bay composed of three separate anchorages. We explored the beach and climbed up one of several arroyos to natural caves which had been occupied in an earlier time, based on the crude drawings scrawled on the walls. On our last full day, we sailed south a couple of miles to El Candelero Cove on Espiritu Santo Island for breakfast and although reportedly an excellent snorkeling area, we opted for hot showers instead. As we left this cove, we came within 50 yards of a gray whale and calf. Coincidentally, this sighting was just off Ballena (Spanish for “whale”) Island, named for its shape, about a half-mile off shore. Shortly after the whales departed, we spotted a sea turtle off the bow. 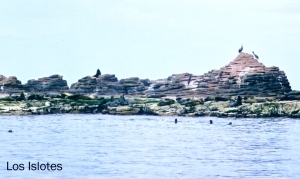 Further south, we anchored in Ballandra Bay on the peninsula to explore one of three beaches and take pictures of the much-photographed Mushroom Rock, also named for its shape. We then continued on in late afternoon to Falsa Bay, about 5 miles from the Moorings’ base, so we could return the boat by 10:00 the next morning. This was our ninth anchoring during the week, always in 15 to 25 feet of water. A relatively small, 4-foot tidal range in this sailing area did not impact our anchoring decisions. The water in all anchorages was crystal clear and often, we could watch our plow anchor settle on the sand bottom. Sandy really enjoyed lowering and raising the anchor with our electric windless … much easier than the hand-over-hand method, especially with 200 feet of anchor chain! In this bay, we had definitely re-entered civilization … trucks rumbled by all night on a road at the head of the bay and ferries from a nearby terminal provided some intermittent wave action. As a more secluded alternative, we probably should have chosen Lobos Cove just a couple of miles further north. But hey, within an hour after breakfast the next morning, we were back at the Moorings. There definitely is a unique feel to sailing in this remote part of the world, far removed from the mayhem of modern life. Jack was right, one feels a sense of adventure here that I’ve never experienced in the Caribbean. The hospitality of the local people was especially heartwarming. And we also had some unique experiences which I have not found in the Caribbean or anywhere else for that matter: bat rays flipping in the air, sea lions swimming at arm’s length, numerous caves to explore, spectacular rock formations, cactus forests marching to the sea, pelicans doing synchronized diving, whales swimming off the bow, and if you listened carefully, a mariachi band playing in the background. Well, seven out of eight ain’t bad! In short, that Baja feeling surrounds you at every turn in the Sea of Cortez. Buy your pesos at home for best rate of exchange. Buy your tequila at the airport duty-free shop for lowest prices. Take your passport if you want to cash traveler’s cheques at a Mexican bank. Fly to La Paz rather than Los Cabos airport for shorter ground transport to the Moorings.